#96791 at North Freedom, March 2001. Sister car #96753, builder’s photo. #96791 was built by the Rodger Ballast Car Co. of Chicago for the Chicago & North Western Railway in 1914. It was designed for “ballast service” to dump gravel (i.e. ballast) on and along railroad tracks. 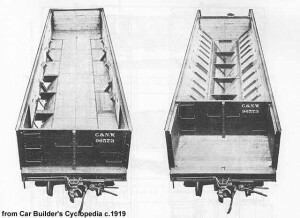 The “Hart convertible” design was unique to Rodger; it could be set up by railroad personnel as a side-dump gondola to unload ballast outside the rail, or as a self-clearing center-dump gondola to apply ballast in between the rails. These were “composite” cars in that they combined steel underframes and body framing with wood side and end sheathing and floors. Converting between the two modes of dumping was not easy, and they could not do both at once. These shortcomings led Rodger to develop a new 50-ton all-steel hopper in the 1920’s which featured an ingenious drop bottom door mechanism. 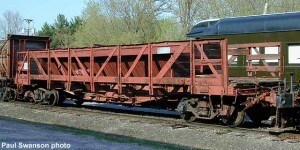 Dubbed “Hart Selective ballast cars,” they could unload to either or both sides, to the center or any combination. The original convertible design made Rodger a prominent early 20th century carbuilder. #96791 served the North Western for nearly thirty years before it was replaced with stronger more durable steel cars. In 1942, #96791 and at least one other sister car were sold to Wisconsin shortline Marinette Tomahawk & Western, located in the north central portion of the state. MT&W’s limited resources required it use secondhand equipment, and #96791 fit that bill. But by the 1980’s the car had outlived its useful service life. In 1984, #96791 found a new home when it was donated and moved to Mid-Continent. The car is presently stored for future restoration as funds allow.